Emmanuel Ohuabunwa is a 22 year old Nigeria from Arochukwu, Abia State. 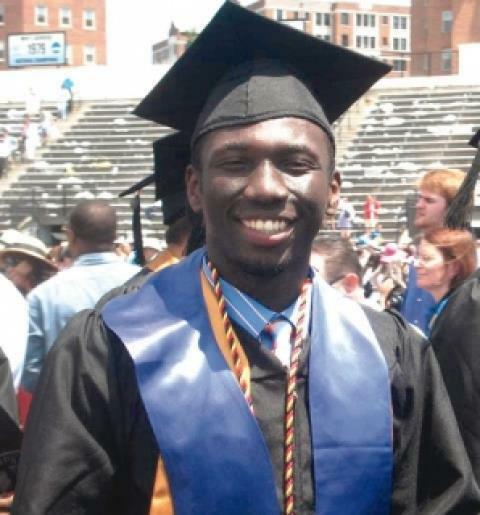 He made history at the John Hopkins University, United States of America by becoming the first black man to make a Grade Point Average of 3.98 out of 4.0 in Neurosciences in the University. For this achievement, he has won a scholarship to Yale University. He also had the highest honours during the graduation that held in May this year. Emmanuel was born in Okota, Lagos and attended primary school in Lagos and part of Secondary school in Ibadan before moving to the USA with his family to continue his education. He's also been inducted into Phi Beta Kappa Society, an academic honour society which “celebrates and advocates excellence in the liberal arts and sciences” and inducts “the most outstanding students of arts and sciences at America’s leading colleges and universities.” in this prestigious honour group you'll find 17 US Presidents, 37 US Supreme Court Justices, and 136 Nobel Prize winners as members. We're so proud of you. Nigerians like to associate with success sha. This boy really tried, I give it to him.